Ok, now we’re back to Pinterest crafts – and just in time for the holidays. This project comes to you from Martha Stewart. I was so proud of how mine turned out… and I even think I one-uped Martha because of the variety of colors and combos I made. I actually made 9 of them! (I could only fit 5 of them on the stool). I think part of what made me so happy about how these turned out is because I had seen some reviews by other people who had intended to make this craft and got upset about the cost of the materials. So, for all the nay-sayers: don’t buy buttons from fabric stores for this project! I got a several packs of multi-sized buttons of different color schemes from Wal-Mart between $1-$5 (depending on how many buttons were in the packs). The ribbon is from Dollar General. 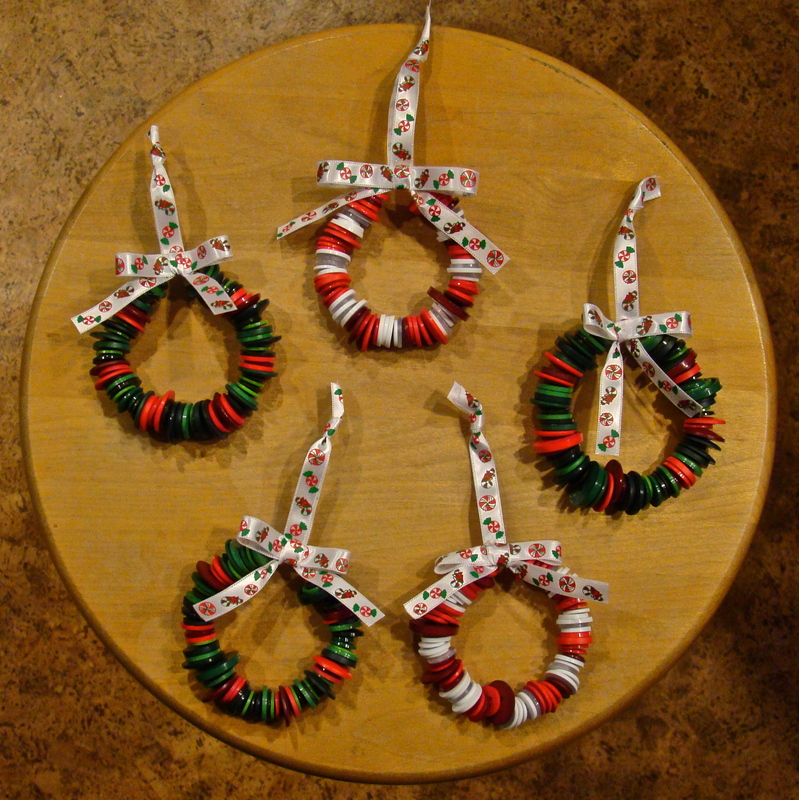 Not an expensive project to get 9 unique button-wreath ornaments. Can you say inexpensive Christmas presents? And for the record: I am not a perfect bow-tier. I am, however, a decent, bow constructor/gluer. Yes, that means I folded and glued ribbon to make it look like a tied bow! This entry was posted in Crafts and tagged crafts, Holidays, Martha Stewart, pinterest, presents, wreaths.